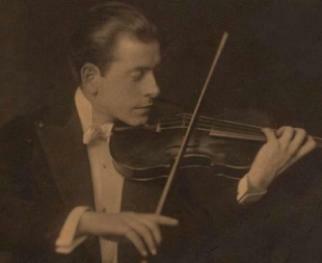 Eugene Ormandy (Jeno Blau) was a Hungarian violinist, conductor, and arranger born (in Budapest) on November 18, 1899. Since he became a famous conductor, hardly anyone remembers that he played violin. He enjoyed the longest tenure (unlikely to ever be surpassed) of any American conductor – 44 years with the Philadelphia Orchestra. Nobody seems to know where the name “Ormandy” came from – he only adopted it after coming to the U.S. in 1921. He began studying violin at the Royal Academy of Music (the Franz Liszt Academy) at age 5 then studied with Jeno Hubay (from age 9) for a number of years graduating at age 14, though some sources say at age 17. Eddy Brown was a fellow student of his – in fact, when Brown and Ormandy competed in the Budapest Concerto Competition, Ormandy took second prize and Brown took first. He then also studied Philosophy and received a degree in that subject in 1920. For a time, Ormandy served as concertmaster of the Bluthner Orchestra in Germany and made recital and concert appearances as well. In the U.S., he started out playing second violin in the Capitol Theatre Orchestra in New York City. This was a rather large orchestra comprised of about 75 players of which Elias Breeskin, the notorious gambler and future father of Olga Breeskin, was concertmaster. However, being a superlative violinist, Ormandy was soon promoted to concertmaster. He was 22 years old. Though he had been trained as a concert violinist, he never got a chance to concertize in this country since he quickly developed a taste for conducting. Nevertheless, he recorded as a solo violinist between 1923 and 1929. I do not know where those recordings can be found; perhaps among his archives at the University of Pennsylvania. Among other conductors who entirely abandoned the instrument are Neville Marriner, David Zinman, Pierre Monteux, Charles Munch, Orlando Barera, Theodore Thomas, and Jaap Van Zweden. Though he conducted the New York Philharmonic in 1929, Ormandy’s big break came on October 30, 1931, when he was asked to substitute in Philadelphia for an indisposed Toscanini – the ill-tempered Italian conductor. Many a big career has been launched under similar circumstances. It is known that Arthur Judson, another violinist who abandoned the violin (in favor of concert management), helped him to establish his career. In 1931, he was appointed conductor of the Minneapolis Symphony and stayed until 1936. That year (1936), he was appointed to his post in Philadelphia where he stayed for 44 years (1936-1980.) He actually shared the post with Stokowski for the first two years. Though he conducted many U.S. premieres, he never came close to Theodore Thomas’ record of 112 works premiered with the Chicago Symphony. His most historic recording might be the three Rachmaninoff piano concertos he recorded with the composer at the keyboard. His recorded legacy is very extensive and can be easily accessed on the Internet. The Philadelphia Orchestra under Ormandy was the first to tour China (1973) and the first to appear on American Television (1948.) He sometimes guest conducted other orchestras too - the New York Philharmonic, the London Symphony, and the Metropolitan Opera among them. Ormandy died (in Philadelphia) on March 12, 1985, at age 85. He died of pneumonia, just as did Theodore Thomas eighty years before him. Ormandy worked before the era of flamboyant, jet-setting conductors who are sometimes in charge of two or three orchestras simultaneously.